Told through the eyes of four tenacious strangers, A Teachable Moment examines the signs, occurrences and long, often miraculous, road to recovery that stroke survivors face. Mark, Roderick, Anne and Lee deliver raw accounts of hospital visits, battles with paralysis and the triumphant fulfillment of discovering a new normal. Family members describe the stroke events, as well as the need for a strong support system that can adapt throughout the difficult journey. A family man. An entrepreneur. An adventurer. Mark French was known as Superman to many who looked up to him at home and work. But fear set in after suffering two massive strokes with a grim diagnosis — Mark had a one-percent chance of ever walking again. With unflinching willpower, he embarked on a healing journey that has found him not only walking but skiing again. As founder and CEO of Leading Authorities, Inc. and its LAI Video production arm, Mark dedicates time and resources to sharing his message of hope and healing. The making of A Teachable Moment is just one of his many projects to raise awareness around stroke prevention. A veteran. A father. An athlete and two-time stroke survivor. Roderick Dunston was at the top of his game in 2010 when his first stroke went unnoticed. He thought he had a cold and ignored the signs. But the second stroke stopped him in his tracks, leaving the left side of his body numb and his heart’s functionality inadequate. Unemployed and uninsured, Roderick took healing into his own hands, teaching himself speech and physical therapy. He created the Roderick Dunston Foundation with a mission to reduce the incidence and impact of this life-threatening medical condition. Unfortunately, during post-production of A Teachable Moment, Roderick passed away. The film is dedicated to his memory. A legal powerhouse. A loving wife. A dedicated mother. Anne Dailey was known as a pillar in her family until a weekend trip to her office shifted her life in a direction she never imagined. The granddaughter of a stroke survivor, Anne was determined not to be a burden on her family during recovery. She laced up her sneakers on the road to recovery and never looked back. Anne is a partner at Troutman Sanders and remains a staple for wellness initiatives, including the annual charity race, Lawyers Have Heart. A father of five. Thirty-seven years old. Lee Stroy faced the biggest setback in his life after having three strokes, including one on Christmas Day. Lee credits the power of a loving support system and positive thinking for turning his severe setback into a setup. With fierce determination, he transformed his physical, emotional and spiritual behavior, embarking on a healthy lifestyle that inspires others to do the same. A Teachable Moment features leading experts and clinicians that shed light on the science of stroke and the preventative steps and lifestyle choices that reduce the risks of suffering from the neurological disorder. Dr. Alexander Dromerick is a neurologist and rehabilitation physician who focuses his clinical and research activities on brain recovery and restoration of motor function after stroke, traumatic brain injury and limb loss. His research aims to improve arm recovery after stroke, reduce recurrent stroke in urban underserved individuals and restore brain function through neuroplasticity. Dr. Dromerick is Vice President for Research at MedStar National Rehabilitation Hospital, Professor of Rehabilitation Medicine and Neurology and Chairman of Rehabilitation Medicine at Georgetown University Medical Center in Washington, DC. He is also a Research Scientist at the Washington DC Veterans Affairs Medical Center and a volunteer for the American Heart Association. Richard Benson, MD, is the Associate Medical Director of the Comprehensive Stroke Center at MedStar Washington Hospital Center. He is also an Associate Professor of Clinical Neurology at Georgetown University Medical Center. 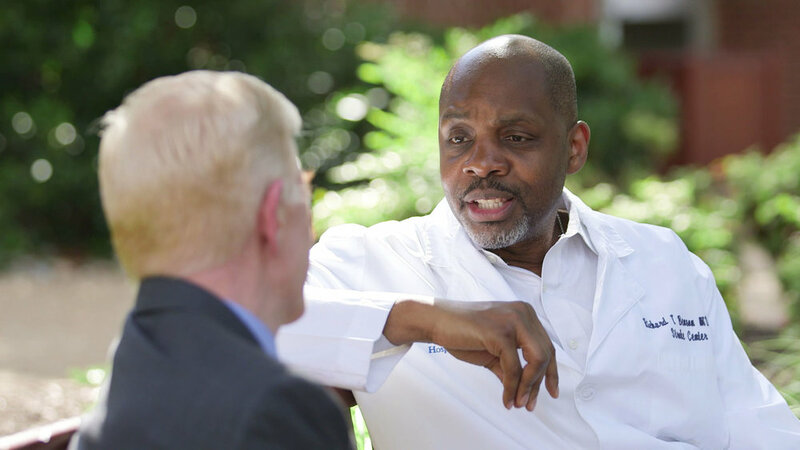 Because of his passion to decrease and/or eliminate the impact of cardiovascular disease, he is very active with the American Heart Association (AHA), for which he serves as a member of the Board of Directors for the Greater Washington Region. As Chair of the Missions Committee, he was responsible for enrolling over 900 community members in the AHA-sponsored Heart 360 “Check it, Change it” blood pressure self-management program. Dr. Benson's areas of interest include: health disparities, minority and community health, issues related to stroke and/or cerebrovascular disease and translational research related to various neurological diseases. Dean Ornish, MD, is the founder and president of the nonprofit Preventive Medicine Research Institute in Sausalito, California. He is also a Clinical Professor of Medicine at the University of California, San Francisco. For more than 32 years, Dr. Ornish has directed clinical research demonstrating, for the first time, that comprehensive lifestyle changes may begin to reverse even severe coronary heart disease, without drugs or surgery. His research showed that comprehensive lifestyle changes affect gene expression, “turning on” disease-preventing genes and “turning off” genes that promote cancer and heart disease. In collaboration with Nobel Laureate Elizabeth Blackburn, PhD, he also showed that these lifestyle changes can lengthen telomeres, the ends of chromosomes that control how long we live. Neal Barnard, M.D., F.A.C.C., is an adjunct Associate Professor of Medicine at the George Washington University School of Medicine and Health Sciences in Washington, D.C., President of the Physicians Committee for Responsible Medicine and Founder of the Barnard Medical Center. Dr. Barnard has led numerous research studies investigating the effects of diet on diabetes, body weight and chronic pain, including a groundbreaking study of dietary interventions in type 2 diabetes, funded by the National Institutes of Health. Dr. Barnard has authored more than 70 scientific publications as well as 18 books, including the New York Times best-sellers Power Foods for the Brain, 21-Day Weight Loss Kickstart, and the USA Today best-seller Dr. Barnard’s Program for Reversing Diabetes. He hosts four PBS television programs on nutrition and health and is frequently called on by news programs to discuss issues related to nutrition and research.